We all know Michael J. Copps as a person and a public official. But I want to speak to Michael’s values. I really didn’t get to the heart of who Michael was until we asked him to speak at my father Charles Benton’s memorial services in 2015. In preparation for this evening, I reread Michael’s beautiful tribute. 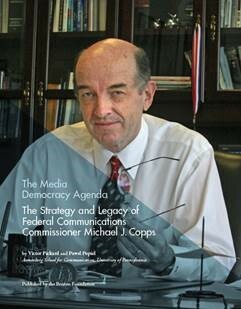 Many of the values that Michael described as ones my father held dear, and which are at the heart of Benton’s work, are the same values that have guided Michael’s life, and are so eloquently described by Victor Pickard's and Paul Popiel’s report, The Media Democracy Agenda: The Strategy and Legacy of Federal Communications Commissioner Michael J. Copps. We understand that communications networks have revolutionized the way we live and that they can help bring us together. We understand that without access to the tools of the new communications ecosystem, people cannot get ahead. And with people left behind, the country cannot get ahead either. So, what Michael and Charles shared is a belief that universal access to, and adoption of, communications tools is a civil right. Because when people are denied access to open, affordable communications, they are cut off from the national conversation. They can’t speak and it’s hard to even listen. And, as a consequence, our democracy suffers. What we understand is that America is about the public interest. When telecommunications and media giants put their self-interest above the public interest, diversity and localism are diminished. And what we cherish and seek to foster is a public service journalism that is today, perhaps more than ever, a democratic imperative – not a luxury. Our new report reminds us powerfully of the themes of access, openness, diversity, localism, transparency, and the power of community engagement – and how these values safeguard the public interest and increase the strength of our democracy. I would like to thank Victor Pickard and Pawel Popiel from the Annenberg School for Communication at the University of Pennsylvania, for the detailed research and beautiful writing. FCC Commissioner Mignon Clyburn, your insightful foreword sets the perfect tone for the rest of the report. As an FCC Commissioner, Michael Copps brought the FCC to the public and the public to the FCC. He engaged broad constituencies in policy discussions. Among these, he valued input and participation from groups he termed “non-traditional stakeholders" like civil rights groups, Native Americans, people with disabilities, and other marginalized communities. By approaching these groups, Michael sought to expand the pool of legitimate stakeholders and participants in media policy decisions, with the assumption that this would also ultimately broaden the range of voices and views represented within our media and improve newsroom diversity. This is as important today as it was during his tenure. The fight for media democracy—to which Michael has dedicated much of his professional life—is ongoing. Michael continues to advocate passionately for the policy positions that he championed as FCC commissioner. He has done so by partnering with Common Cause, Free Press, Public Knowledge, and the Benton Foundation. His fight is our fight. Net neutrality, media ownership concentration, the future of public service journalism—and the larger struggle for creating a media system that reflects the depth and breadth of the diverse communities it is meant to serve—are all vital issues that still challenge us today. The vision for a more democratic system will not perish. Learning from earlier media reformers, we honor their struggle by continuing it. This is something we all must do. Nothing less than democracy is at stake. Michael Copps is the gold standard for public service integrity. Oh, for his kind of principled, the-people-over-the-powerful determination today! Thank you for the inspiration you have been to all of us. Michael J. Copps, there’s a lot to say about what you’ve achieved. But allow me to say, from my heart, thank you for who you are and what you stand for.